Looking to take sole possession of first place in the Big South Conference, Liberty hosted Presbyterian (5-17, 1-10 BSC) at the Vines Center as the lone game Tuesday night in conference. Once again, the Flames (14-10, 9-2 BSC) were stifling on defense forcing a season-high 26 turnovers to come away with the 71-51 win over the Blue Hose. Myo Baxter-Bell scored a career-high 19 points along with four steals, three rebounds and an assist. The Flames did an exceptional job of moving the ball around as McKay’s squad dished out 20 assists on 26 made field goals. Twenty-six turnovers were the second most recorded by a Big South team this season, just three away from the season high set by Radford. Guard Georgie Pacheco-Ortiz recorded a career-high six assists to go along with six points without committing a single turnover. Ed Drew and Reggie Dillard paced the Blue Hose, each scoring 12 points. Drew also pulled down a game-high eight rebounds for Presbyterian. After Liberty made a free throw to start the game, Presbyterian went on a 7-0 run to jump out to an early lead. The Flames missed their eight field goal attempts but Baxter-Bell ended the drought, scoring Liberty’s first field goal for the fourth straight game at the 14:35 mark. Despite Liberty struggling on offense to start the game, its defense remained strong, forcing five turnovers in the first seven minutes of the game. The Flames held Presbyterian to a scoring drought of three minutes while going on an 11-0 run to take the lead with eight minutes left in the first half. Baxter-Bell led the charge early with six points, two steals and a rebound during the first half. Late in the first half, Liberty went on another run to extend its lead sparked by the three-ball. The Flames made a trio of three-pointers that jumpstarted another 11-0 run to make it 25-13 in favor of the Flames with 2:43left in the half. For the first half, Liberty limited Presbyterian to just 21 points, tied for the fewest points they have scored in the first in during conference this season. After struggling from beyond the arc to open the game, Liberty would make five threes in the final nine minutes of the first half to take a 30-21 lead into halftime. Presbyterian has had 15 or fewer turnovers in the eight of its 10 Big South games this season, but Liberty’s pressure defense forced the visits to give the ball away 16 times during the first half. During the opening period, the Flames were able to convert 11 steals into 20 points off turnovers and Ryan Kemrite led all scorers with nine points in the first half. As Liberty ended the first half from the three-point line, it continued early in the second half, hitting 4-of-8 attempts during in the first 10 minutes including back-to-back threes from John Dawson to extend its lead to 51-32 over the Blue Hose. The turnovers continued to pile up for PC as they accumulated as the matched their previous high of 24 at the 6:20 mark in the second half. As the defense brought Liberty its lead, Brock Gardner brought its fans to their feet with a thunderous alley-oop dunk from Lovell Cabbil to put Liberty up 62-39 with 5:12 left in the contest. Liberty continued to shoot well from beyond the arc as they made five of its 10 threes during the second half. 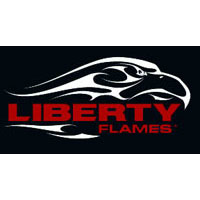 Liberty will return to action on Saturday when the Flames host Radford at 7 p.m. at the Vines Center.